Mobile, soft-sided cd bag with partitions. 1" thermo-foam protection. 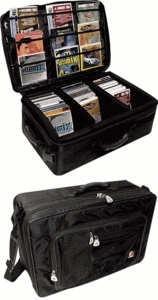 Holds 270 cd’s in view sleeves, or 90 jewel cases. Product Dimensions: Width Height Depth 23" 6" 16"